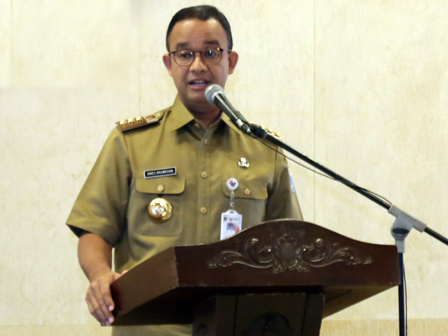 Jakarta Governor, Anies Baswedan hopes City Council's Bapemperda to review the revision of two regulation (perda) according to schedule.
" The point is, we want it to be reviewed on time"
Those are revised regulation draft of Perda No. 16/2010 about Parking Tax and Perda No.15/2010 about Street Lighting (PJU) Tax. "The point is, we want it to be reviewed on time," he stated after attending plenary meeting at City Council Building, Monday (5/14). Generally his side has answered all factions' viewpoints in his speech in front of City Council members and leaders before. "I have noted several things that I need for street lighting tax development," he added. In the same location, City Council Deputy Head, Mohammad Taufik supports the revision of those two perda. According to him, it needs regulation that explicitly regulates about street lighting tax to increase the local revenue (PAD). "From factions' viewpoints in City Council, all of them are agreed with what the provincial government proposed," he conveyed.